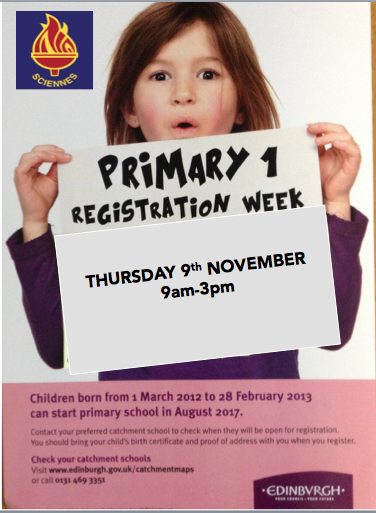 P1 Registration for August 2018 is on Thursday 9th November between 9.00am and 3.00pm. If your child's date of birth is between 1 March 2014 and 28 February 2014 they are due to start primary school in August 2018. If you are in the City of Edinburgh Council area you must register your child for P1 at one of your catchment schools during registration week. If you live in catchment, please come along on Thursday 9th November 2016, 9.00–3.00pm to complete an enrolment form. Names, addresses and telephone number of three emergency contacts. N.B. these are the ONLY accepted forms of proof. Please feel free to bring your child but this is not essential if s/he is attending nursery. There will be transition and induction opportunities for your child to visit school in the summer term.